June 12 is the feast date* of Saint Eskil, a martyr to the slow Christianization of Scandinavia. Ol’ “God-kettle” was one of several missionaries known to have been dispatched in the 11th and 12th century from England to Sweden, a traffic in religious conversion across the North Sea crossroads to invert the centuries-past course of Vikingers who put so many British sanctuaries to the sack. The Northmen realms were ripe to join Christendom but sagas touching the time describe an uneven transitional period where the new and old faiths jostled for primacy. “Ingi was king for a long time, well-liked and a good Christian; he put down [pagan] sacrificing in Sweden and ordered all the people of the land to become Christian,” runs The Saga of King Heidrek the Wise** (available in pdf translation here), about King Inge the Elder. But the Swedes had too strong a belief in the heathen gods and held to their ancient ways … the Swedes thought that King Ingi had infringed their rights under the ancient law of the land, when he found fault with many things that Steinkel his [Christian] father had let be; and at a certain assembly which the Swedes held with King Ingi they gave him the choice of two things, either to observe the ancient laws or else to give up his throne. Then King Ingi spoke, and said that he would not leave the true faith; whereat the Swedes cried out, and pelted him with stones, and drove him from the law-assembly. Svein, the king’s kinsman, remained behind at that assembly, and he offered to make sacrifice for the Swedes if they would grant him the kingdom; all agreed to Svein’s offer, and he was accepted as king over all the Swedish realm. Then a horse was led forth to the assembly, hewn in pieces, and divided up for eating, and the sacrificial tree was reddened with its blood. Thereafter all the Swedes cast off the Christian faith, and sacrifices were instituted, and they drove King Ingi away; he departed into western Gautland. For three years Svein the Sacrificer was king over the Swedes. King Ingi went with his own bodyguard and some followers, though it was only a small force … into Sweden; he rode by day and night and came upon Svein unawares in the early morning. They seized the house over their heads and set it on fire, and burnt all the company who were inside … Svein came out and was cut down. And so Ingi took the kingship of the Swedes anew, and restored the Christian faith; he ruled the realm till the day of his death. The “Svein” referred to here is a gentleman whom the historians recall as Blot-Sweyn — “Sweyn the Sacrificer” — and this Norse answer to Julian the Apostate apparently enjoyed his interregnum authority in about the 1080s thanks to Inge’s disrespect of the old rites still honored at the ancient Temple at Uppsala. The timeline of high statecraft is extremely sketchy, and Saint Eskil’s relationship to events doubly so. Commonly recalled as a victim of the Blot-Sweyn period, Eskil is first marked in the 1120s annals of another Anglo-Saxon monk abroad in Scandinavia, Aelnoth from Canterbury — “Eschillus of sacred memory” who succumbed evangelizing to the “barbarorum feritate.” That’s the whole of it, with nothing like a year or a regnal era to hang one’s hat upon. 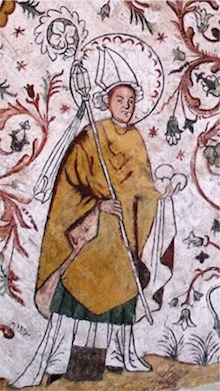 In the 13th century, with Christianity truly triumphant, a hagiography of Eskil greatly embroidered the martyrdom story and tied it to the land’s most notorious rearguard ruling unbeliever, featuring a cast of heathens so nonplussed at the monk’s interruption of their feast that, notwithstanding his show of divine miracles, Blood-Sweyn has him sentenced to immediate stoning. The town of Eskilstuna bears his name (it used to just be “Tuna”).